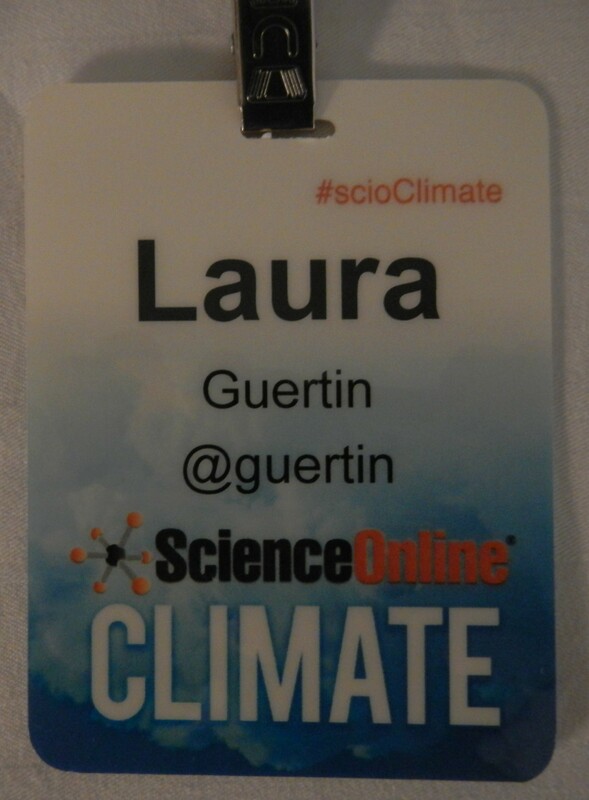 Name badge – with Twitter handle but no institution or affiliation listed to “level the field” among all attendees. This two-day event is not your traditional climate science meeting. With an un-conference format that is driven by participants and emphasizes conversation, ScienceOnline Climate will explore the intersection of climate science, communication, and the web. Complex scientific concepts will be interwoven with creative communications approaches through the connective power of the internet. It will be an energizing experience for scientists, journalists, artists, policymakers, and attendees from all nodes of the climate communications ecosystem. I had heard of ScienceOnline for the first time about a year ago, when I saw they have a national annual conference (ScienceOnline) that connects science and the internet. Although the concept certainly piqued my curiosity, I knew I had to be careful and not overextend myself – between the Geological Society of America, American Geophysical Union, and the Council on Undergraduate Research, I’m already attending/presenting at 2-3 conferences a year, and I cannot add additional conferences to my schedule if they would impact my teaching or research. But with a subject focused on a topic I teach about, and not teaching this year because of my sabbatical, AND the conference just a short Amtrak ride away, I knew this was the time and opportunity to check out ScienceOnline Climate. And I wasn’t the only one that jumped on the ScienceOnline train – 81% of the people in attendance at this meeting have never attended a prior ScienceOnline conference. The conference started with a welcome speech that I have never heard at any other conference – “we encourage you to keep your cell phones out, but the ringer off.” It figures that a conference called ScienceOnline, a conference that puts everyone’s Twitter handle on their name badge, wants everyone to use social media to share the conference information beyond the conference attendees at AAAS. I also found it interesting that the opening remarks mentioned that “face-to-face meetings are still the key way to build community” (interesting – maybe this is why students still prefer face-to-face versus online courses, because of the community building that takes place?). 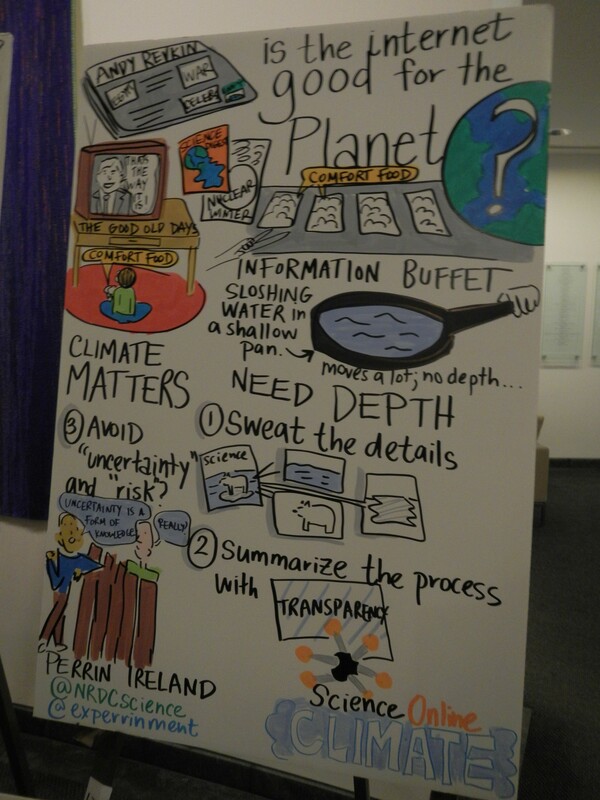 Live scribing during the sessions completed by Perrin Ireland – an amazing talent! The morning continued with the first keynote, where Andy Revkin jumped right in with a challenging question – is the internet good for the climate? His talk was live-streamed and is now available online at his New York Times blog Dot Earth. We were also treated to a live performance of Andy strumming his guitar to his original musical score, Liberated Carbon (Penn State students – think Richard Alley and Ring of Fire). I have five takeaways from his presentation: (1) it is hard to find climate stories on the news today, with all of the global current events taking place (see newsmap.jp and try to find an article – go ahead, try it! ); (2) there exists a tricky interface between the “is” (the science) and the “ought” (what we do about it); (3) we should get comfortable communicating with multiple audiences – when writing an abstract, also write the same abstract but for a general audience; (4) I am in the “nerd loop” (here we are at ScienceOnline, people sitting in a room communicating about communicating instead of going out and doing it); and (5) climate matters, water matters, and energy matters. More session notes (much better than mine!) – thanks to Perrin Ireland. 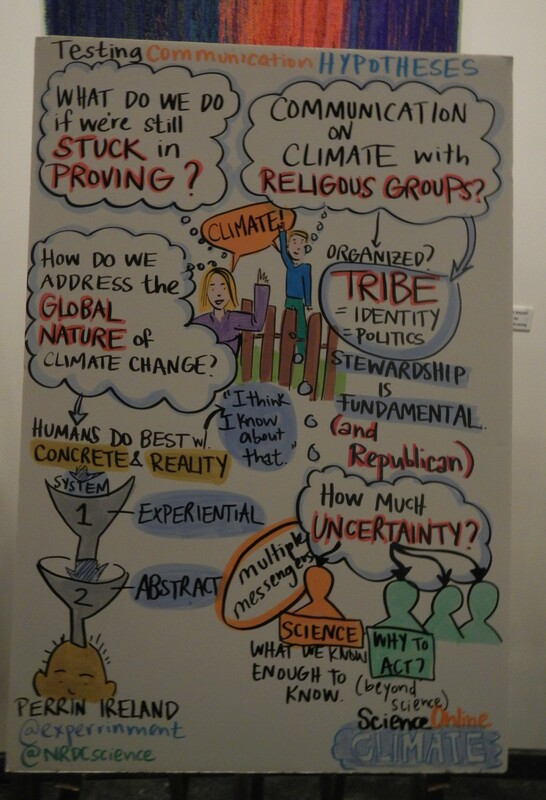 Next up was a plenary panel titled Testing Climate Communication Hypotheses, with Bob Deans (NRDC – Natural Resources Defense Council), Ed Maibach (George Mason Univ. ), and Lisa Dropkin (Edge Research). This was a great panel with speakers from different disciplines, all providing great insights and advice about communication and advocacy when it comes to climate science and climate change. Bob caught my attention right off when he went to the microphone and said, “what I say doesn’t mean a thing!” He expanded upon this statement, saying that it is more important to know what you (the listener) hear, what you understand, and what you remember. He said there is a difference in communicating with the public versus communicating with ourselves (speaking with our “tribe”). Lisa also challenged the audience right away with a quality question – who are we trying to convince to do what? My takeaways from this panel: (1) science communication should be viewed as a sports team, with a content expert, communication specialist, etc. ; (2) we (the human population) does not have a grasp on our world and our place in it; and (3) we have to put climate change in people’s backyards, in a context where they can understand it (for example, instead of talking about polar bears, talk about drought and increasing food prices). These are all valuable ideas I can immediately integrate into my courses I teach (watch out, students! Be on the lookout for more of a direct Philly connection in class). Then the audience broke off to different sessions, and I decided to go to the session titled, “Can Art Provide A Deeper Understanding of Climate Change?” I have to admit, I was really not sure what to expect from this session. I am so used to attending scientific talks at scientific conferences, I was not hopeful that I would get much out of this session I could apply to my teaching. I COULD NOT HAVE BEEN MORE MISTAKEN! This session was really amazing and engaging. I knew about the pieces of the Icelandic glacier on display at MOMA in NYC, and I had actually seen the hyperbolic crocheted coral reef at the Smithsonian with some of my students, but living in a wooden egg in a river? Or Diane Burko’s Politics of Snow art? Or how about videos and movies that communicate a climate message, such as The Last Ocean? And I never knew there were so many blogs out there that already explore the intersection of art and science, such as Scientific American’s Symbiartic and the Smithsonian’s Collage of Arts and Sciences. One takeaway for me – I should be looking for local art exhibits with a science theme (or a way for me to make a science connection) to take students to, such as the current Sensing Change display at the Chemical Heritage Foundation in Philadelphia. Why am I not exploring these connections already???? I’m going to have to keep my eye on the blog of session moderator Michele Banks (The Finch + Pea) for more news and inspiration on the art side! Next up – lunch! And this is where I’ll end this post (notice I have AM in the post title). I’ve never had a conference with so much packed in to one day, I have to split my posts so they don’t scroll on and on and on (trying to be sensitive to how I’m communicating now!). Be sure to check out DC – ScienceOnline Climate, Day 1 (PM).